Born Arthur Fellig in June 1899, Weegee was a photographer and photojournalist celebrated for his striking black and white street photography. Working as a press photographer during the 1930s and 1940s, Weegee developed his signature style by following the city’s emergency services across the Lower East Side of New York City and capturing their activities. 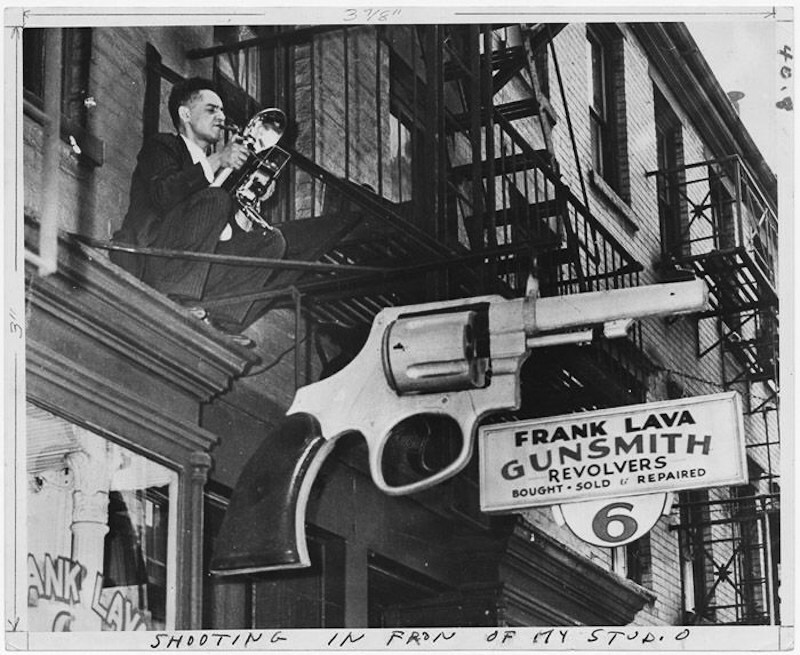 As such, much of Weegee’s work depicts uncompromising scenes of crime, injury, urban decay, and death. Born near Lemberg in Austrian Galicia, Arthur Fellig immigrated to New York City with his family in 1909 and began working odd jobs, one of which was working as a street photographer of children on his own pony. Fellig started working as a darkroom technician at Acme Newspictures in 1924, but left in 1935 to pursue a freelance photography career. Not one to wait for an opportunity to come his way, Fellig started out by going to the Manhattan Police Headquarters and waiting for a story to come over the police teletype. Once the story came across the police teletype, Fellig would compete with the police to be the first at the crime scene in order to capture his images unfettered by police interference. Selling his photographs to tabloids and photographic agencies, Fellig’s photographs soon appeared in the Herald Tribune, World-Telegram, Daily News, and the New York Journal American. While there are various theories – similar to the number of theories on how to win online blackjack – as to how Fellig earned the nickname Weegee, the curious name was actually a phonetic rendering of Ouija owing to his uncanny, almost physic ability to arrive at the scene of a crime only mere moments after it had occurred. By 1938, Weegee was the only newspaper photographer in New York City with a permit to own a portable police-band shortwave radio. He listened closely to the broadcasts, often beating authorities to the scene, and maintained a full darkroom in the trunk of his car in order to expedite the delivery of his images to local newspapers. Five of Weegee’s photographs were acquired by the Museum of Modern Art in 1943 and he published his first book of photographs entitled Naked City in 1945. Weegee began experimenting with panoramic photographs, photography through prisms, and photo distortions during the 1950s and 1960s. He even photographed Marilyn Monroe using a plastic lens which rendered the image of her face grotesquely distorted, but her beauty was somehow still recognisable. Weegee was also involved in the Hollywood industry from 1946 to the 1960s as both an actor and consultant and worked alongside directors such as Stanley Kubrick and Jack Donohue. 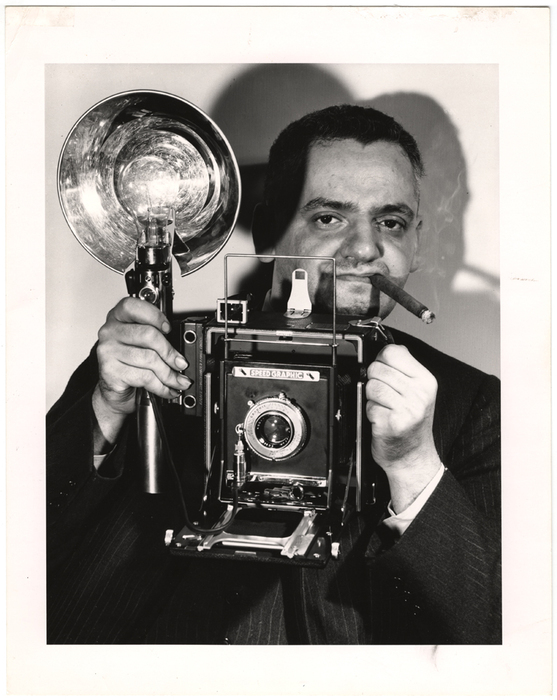 Weegee developed diabetes in 1957 and died at the age of 69 on 26th December 1968. It has been noted that Weegee inspired Diane Arbus in the early 1960s owing to his frequent themes of nudists, street people, and circus performers. Following his death, the entire Weegee archive made up of 16,000 photographs and 7,000 negatives was donated to the International Center of Photography in New York.